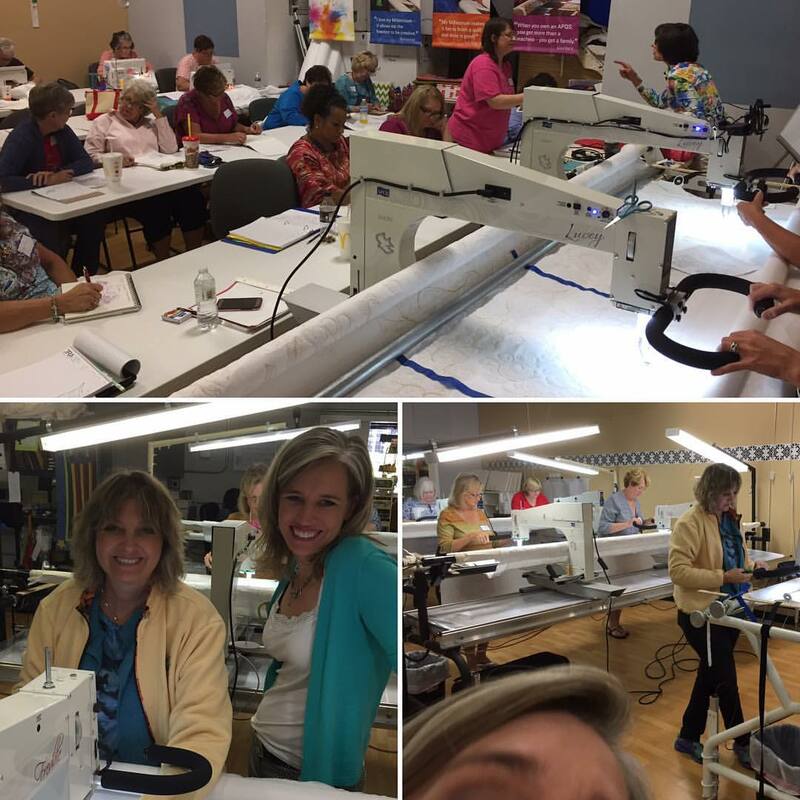 For three wonderful days, Bethanne Nemesh shared her wisdom and creativity with quilters here at Quilted Joy. The longarm machines were all humming (two to a table!) and the classroom was packed for each of the five classes. In Hands-On Nemeshing, students learned how to create freehand backgrounds based upon feathers, pebbles, and other motifs. Bethanne showed the students how to make the fillers look organic and unique. Students drew and quilted their Nemeshing-style motifs. In Feather Faster, Bethanne showed students that they didn’t need to trace individual feathers before quilting them. Instead, they learned how to use basic feather shapes to fill spaces freehand. This method frees quilters from using pre-made stencils that were not necessarily designed for their quilt’s specific needs. In Freehand Fantasy, another hands-on class, students developed new shapes based upon Bethanne’s basic feather shapes. They practiced quilting holly leaves, oak-and-acorn motifs, pinecones, scimitars, and many other shapes. In Sampler Quilt Smackdown, Bethanne analyzed several sampler quilts. She discussed different options for how they could be quilted, including creating secondary designs around blocks and even around the center of the quilt itself. In The Devil Is in the Details, the class created samples of several methods of finishing the edges of quilts. The techniques including beaded edging and coloring on quilts with Derwent Inktense pencils. Bethanne even gave our good friend Linda a shout out for her beautiful wall hanging. Using Bethanne’s The Devil is in the Details book, Linda added beaded piping to accent the leaves in her beautiful quilt. In between all of these classes we managed to find a few minutes to give the new Facebook live feature a try. In the video Bethanne and I chatted about the classes, quilting, our inspirations, and more. You can watch that video on the Quilted Joy Facebook page. If you haven’t already, be sure to like us on Facebook so you can catch any other live videos we do in the future! We have all five of Bethanne’s books and her three new paper pantographs in stock if you’d like to learn more about her unique techniques. You can find them here. Thank you, Bethanne, for a great week! Previous post: Back on the Set of Fons & Porter!